Recently I was working with a friend on performance issue and she asked an simple question. I use activity monitor tool which is provided with management studio. When I look at the Resource Waits group, there is a column called Wait Category. What does that show and how data is picked? Here is the screenshot from my machine. At almost same time, same question popped in Facebook group (SQLBangalore) as well. So I decided to dig into more details. Captured the profiler and found that Activity Monitor uses two DMVs to show the values in that section (Resource Waits). sys.dm_os_waiting_tasks for threads that are in an in-progress wait. Here are the various waits we could potentially see. How did I find this? By running profiler! As per profiler, the waits related information in Activity Monitor (AM) is populated by procedure #am_generate_waitstats. This is created when AM is launched. The temporary table which is populated in #am_wait_types which has mapping of “display” values and DMV values. Hope this helps in understanding Activity monitor wait category little better. How many times you have been into a situation where you need to run one query across many servers? I have asked his question from one of the DBA and his answer was I will create a linked server and then modify the query to refer linked server. Well this needs modification to server configuration and most of the production server don’t allow changed without change request. The better approach would be to use an under-estimated feature of SQL Server Management Studio called as Multiserver query. This can be done via by creating a group and registering one or more registered servers within the groups. Once group is created then we can query the complete group and the result format can be customized. Pinal (b|t) has written a blog here. This is a extension of that blog in little more details. We can right click on any of the node and choose “New Query” as shown below. Color Customization can be done by going to Tools > Option > Text Editor > Editor Tab and Status Bar as shown below. From above, we can also change other setting for status bar but they are not specified to multi-server. If we ran a query in this query window, it would run on all the servers and give results. We are seeing same number of databases on 1st and 4th row in my lab because they are same servers. dot (.) and (local) both means local server. Note: We can’t join two tables across the servers using multiserver query feature. Hope this would help in getting some quick reports from various servers. Sometimes we are very comfortable and used to with certain things that if they change, we become nervous and uneasy. I have a lovely daughter and she always greets me when I come back home from office. That one “hello” takes away all my worries and I feel alive. Yesterday she didn’t do that and I was worried. I checked with my wife and she told that there was a mild fever and her mood is little different today. That made me little nervous. I went to Tools > Option in Management studio and found that there was a customization done on batch separator. SSMS> Tools > Options >Query Execution > SQL Server > General > Batch Separator. Which means if I run with “come” it should work and as expected. Here is the usage of parameter –c . I have used hello as command end parameter and hello works same as go in true sense. I hope this clears some confusion about batch separator. 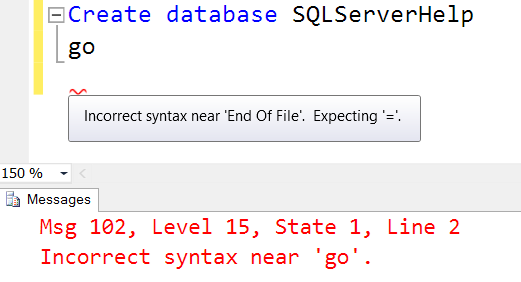 If you are getting this error while using ExecuteNonQuery in .net program and running script then refer http://blogs.msdn.com/b/onoj/archive/2008/02/26/incorrect-syntax-near-go-sqlcommand-executenonquery.aspx which has a workaround.